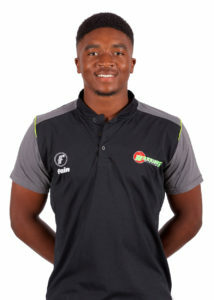 Lutho Sipamla brings youth and energy to the Warriors, the old boy from Grey High School is a right-arm fast bowler, who was born in Port Elizabeth on the 12th of May 1998. He enjoys spending time with friends and family especially if they’re eating good pasta. The highlight of his career so far is making his debut for the Warriors at the Wanderers Stadium. He made his debut in January of 2017. He has played for Eastern Province and the Warriors Cricket team. If he wasn’t playing cricket, he would be a Chartered Accountant but luckily, he joined the Cricket Academy in Port Elizabeth which is where he fell in love with the game. His role models include Michael Holding, Brett Lee and Eastern Cape born and South African legend, Makhaya Ntini.